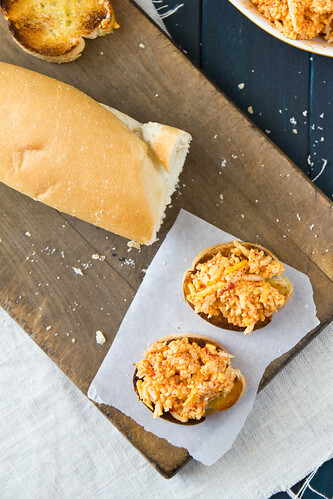 Those are by far my top two sources for photography props and food styling accessories. They’re extremely budget-friendly and most of the pieces are well-worn and pretty unique when compared to, say, the small stack of 2-yr old napkins and placemats that I have from Target. A few weeks ago, I picked up a second-hand wooden cutting board at Goodwill. I loved that it was worn and that the surface has definitely seen it’s share of serrated knives, chopped tomatoes, and sliced onions. And I loved that it had been used as a “holy crap, this thing is hot! !” trivet. And I super loved that it was priced at 99 cents. Seriously. 99 cents! What I didn’t love? That golden, honey-yellow finish. What I wanted was a darker surface with that patina/aged wood look. But I’m married to a hobbyist woodworker so I know that golden, honey-yellow finish is easily banished and that patina/aged wood look is just minutes away. We stumbled across a pretty neat technique to quickly age wood when researching finishing methods for a house project: a mixture of tea and iron solutions can turn wood from bright “I’m brand new” yellow to “someone left me on the patio for 2 years” grey to even a “yeah, you just try to get this deep a color with regular wood stain” dark brown. The science is simple. Okay, simple-ish. 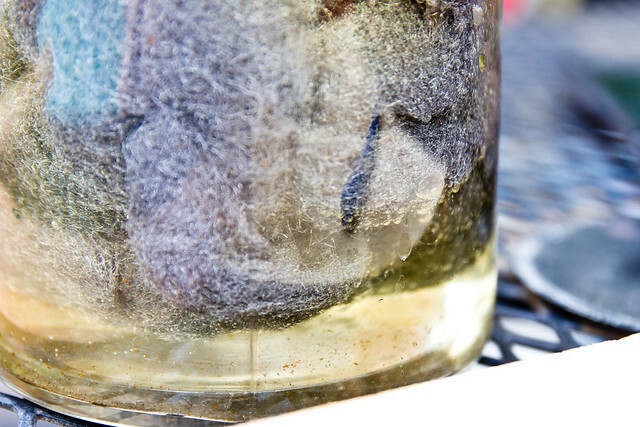 The iron solution is made from steel wool and vinegar. When brushed on wood, it reacts with tannins in the wood to mimic the aged patina that time and weather impart. And when extra tannins are applied to the wood in the form of a very strongly brewed tea, that stain gets even darker. Top to bottom, that’s walnut, aspen (the wood that we used for our tabletop props), and pine using a 24-hour old iron solution. 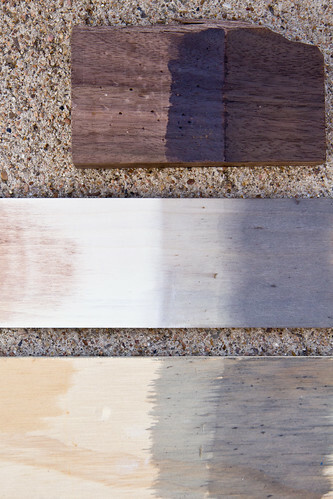 Left to right, that’s the wood in its natural state, painted with the iron solution, and then painted with tea and iron solutions. Oh, and I painted the walnut scrap backwards. Doh! And the solution gets stronger as it sits. After 72 hours, we were able to turn the surface of pine nearly black. It’s a beautiful finish for an otherwise budget cut of wood and definitely not one that’s easily achievable with ordinary wood stain. 1 pad of 0000 steel wool – 0000 (it will state as such on the package) is the finest grade of steel wool and will disintegrate faster. Using a more coarse grade of steel wool will likely be okay, but you might not get as strong a reaction as quickly. Note that this is not the scrubby SOS pad you’ll find at the supermarket. You’ll want to go to a hardware store or a home improvement store to find it. Medium-to-fine sand paper – it really depends on the condition of your wooden subject. A wooden subject – any real wood will do, different woods will exhibit different staining characteristics. Finishing wax or other food-safe wax/oil to polish the finished piece, if desired. I lathered the steel wool with a few drops of dish soap to remove any oil. After rinsing it very well and shaking off excess water, I stretched apart the steel wool so it wasn’t so compacted, and then placed it in a large glass container. I set the lid very loosely ajar and placed it on the patio overnight to allow the chemical reaction to get going. See the bubbles? Chemical reaction. – Chemical reaction = safety equipment recommended. Take precautions as you see fit. You know, gloves, goggles, work outside so there’s plenty of ventilation. – Chemical reaction = fumes produced. Do not store this inside your house, do not hang out over the top of the jar while inhaling deeply. – Chemical reaction = gas produced. Do not secure the lid without providing for ventilation first. When your project is over and you decide to secure a top to your jar, either drill a hole in the screw lid or use something like a rubber-banded cloth/plastic wrap/cheesecloth lid so gas can escape. The next day, I brewed up the tea. I boiled 3 tea bags with 1 1/2 cups water until the liquid was reduced to ~1/2 cup. I let it cool, squeeze out the used bags, and transferred the tea to a small, clean jar. I lightly sanded all sides of the board just enough to get rid of the shiny finish so that the raw wood could take in the stain. I wanted to keep as many of the knife marks as possible. I brushed tea onto the top and sides with a paint brush. After that soaked in, I brushed on a second layer. 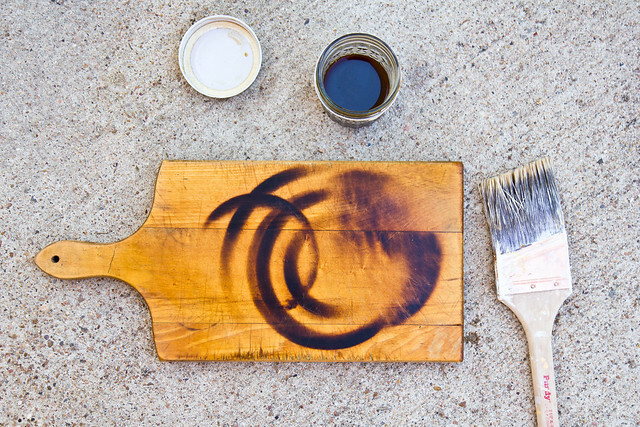 After the second coat of tea has soaked in, brush on your steel wool-vinegar solution using a second (clean) paintbrush to apply it evenly. Nothing out of the ordinary appears to happen at first, but by the time the vinegar soaks in and dries, the magic will have happened. You might want to brush on a second coat – I did. I also only did the top at first to have the back as a reference for contrast. And after I took that picture, I sanded the black streaks away and stained it using a red wine (tannins!) reduction in place of the tea. The resulting stain was a bit lighter. After the wood completely dries, wipe it down with a dry paper towel, and apply a finishing wax or other food-safe oil. My board had a very flat, chalky/ashy appearance to it that went away after using the finishing wax. I was left with a barely-there sheen and a richly stained cutting board. Brilliant – I love this! Thanks for sharing! Exactly what I was looking for! 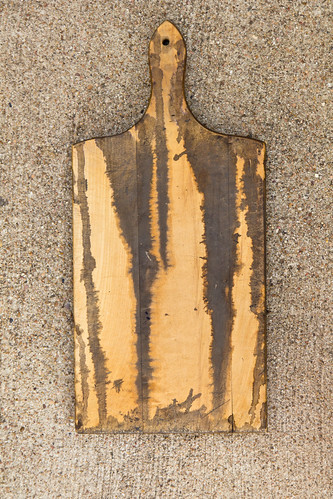 I just picked up a slightly – used board at my Goodwill and was Googling how to age it… thank goodness Google found you for me! I will definitely try this, thank you so much for sharing!! hi, i have tried this on alder wood and it doesnt seem to work, i do not know why, ive followed all the steps, does it have to be white vinegar rather than white wine vinegar? what does happen when i try it it leaves a slightly darker patch but that can just be wiped off very easily, any ideas? I’m a little late to this post, but this is fantastic! 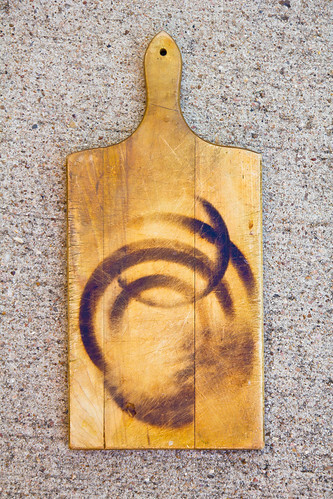 I’ve attempted a few “organic” ideas to get my cutting board stained…none worked. 🙁 I’m so excited to do this! Your board looks great! Thanks so much! the whole project has a vintage look? There is a small balcony—-oh, it just goes on and on! Thanks for sharing your stain recipe and suggestions to get good results! 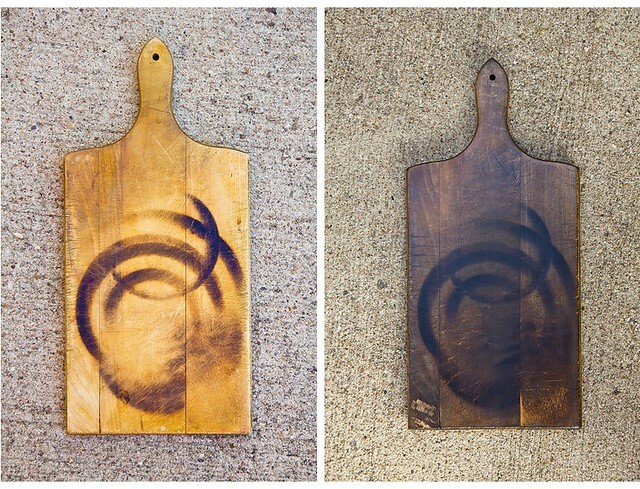 we have been searching for a food safe way to stain the cutting board we had custom made!!! Can we cut vegetables on this? I do – I used a food safe finishing wax that I reapply occasionally. 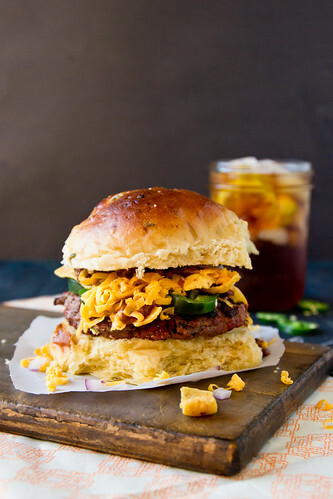 Do you know if the iron acetate created by soaking the steel wool in vinegar is non-toxic for use on a food grade cutting surface? I’d like to use this on a butcher block surface.